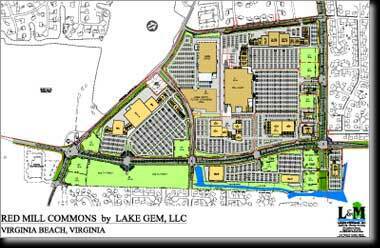 Red Mill Commons is located at the southwest corner of Nimmo Parkway and Upton Drive in Virginia Beach. With over 747,000 square feet, this super regional center is anchored by Super Wal-Mart, Home Depot and includes big box tenants such as TJ Maxx, Michaels, Walgreen's, Pier 1 Imports and Bath and Body Works. With over 90 other retailers, this is a unique, inclusive place to have your one-stop shop. With Red Mill Walk (Phase II) joining Red Mill Commons, this shopping center now encompasses 1,014,000 square feet.